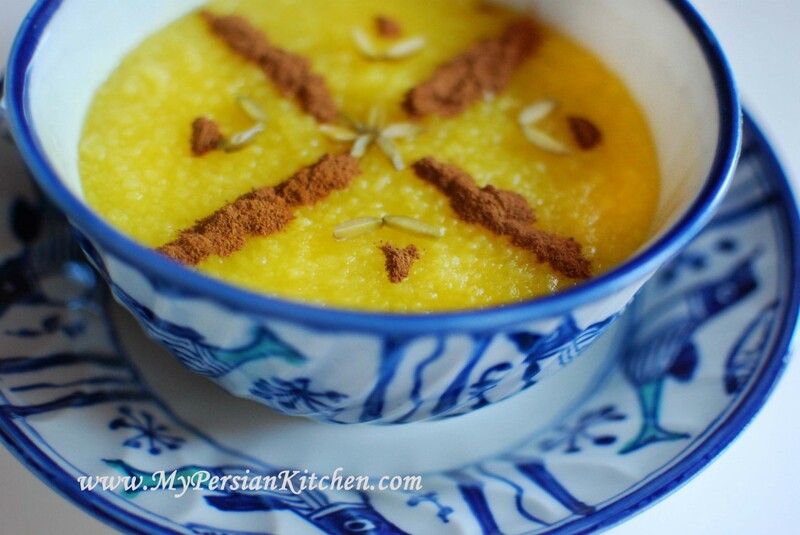 A few months ago I posted a recipe for Persian rice pudding which is prepared with milk. Today’s rice pudding on the other hand is dairy free. For those of you are who are lactose intolerant or vegan, this is a dessert just for you! This recipe came to my from my mom’s friend Iran joon. In Farsi the word joon means dear and it’s often said after a person’s name as a form of respect or endearment. I have known Iran joon pretty much my whole life. If there is an adjective that best describes Iran joon, that would be impeccability stylish. She always wears her hair in the same updo style, her nails are always perfectly polished, and her outfits are well put together. Speaking of her nails, they have always fascinated me. Unlike the rest of us she always wears her nail polish in a way that the color does not cover the right and left ends of her nail. I vaguely remember my mom telling me many moons ago that apparently that’s a sophisticated way of wearing nail polish. Since Iran joon is a fashionista, she would know, unlike yours truly. Anyway, I was very excited when my mom sent over the recipe because it’s always fun to get recipes from her friends…well the ones that come our well that is! Unlike the infamous raisin cookies!! 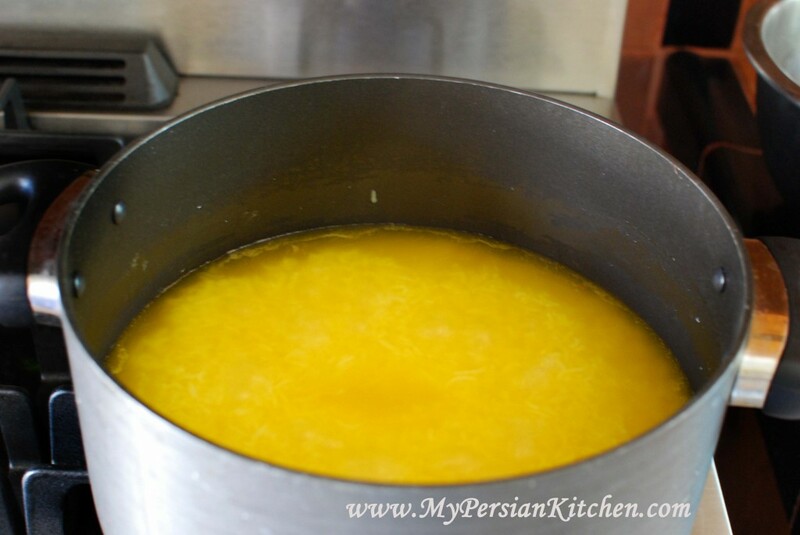 Once I was ready to make the recipe, low and behold I noticed that one element was missing from Iran joon’s Sholeh Zard. No where in the recipe that my mom sent me mentioned putting almonds in the pudding. At first I thought maybe it was forgotten, then I thought to myself, well maybe Iran joon’s recipe is from a part of Iran where they don’t use almonds in their Sholeh Zard. Could either my mom or Iran joon forget to give me an item in the recipe? After I made it I brought the missing ingredient enigma to my mom’s attention. Sure enough somewhere down the line one of them forgot to mention almonds! But have no fears, I have added it to the ingredients in the recipe that I am publishing! 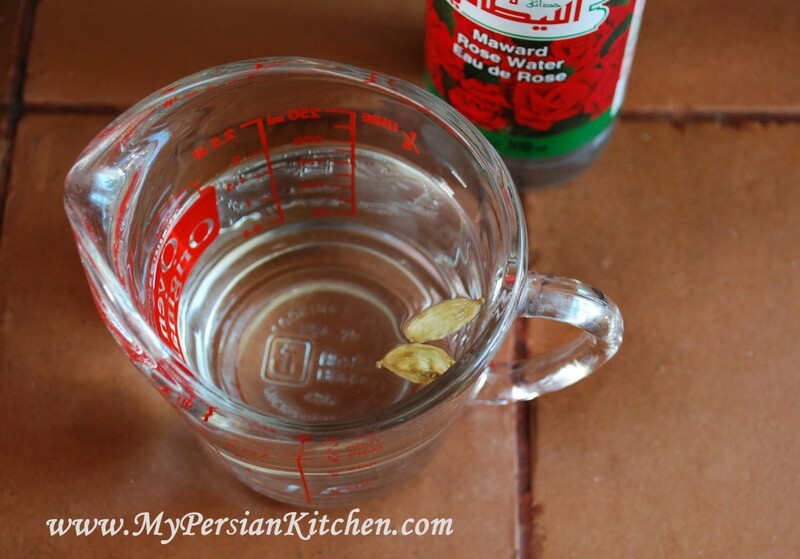 Lightly crush the two cardamom pods and place in one cup of rosewater. Set aside. Cook rice uncovered until tender. This should take about half hour. Grind saffron with a pinch of sugar. 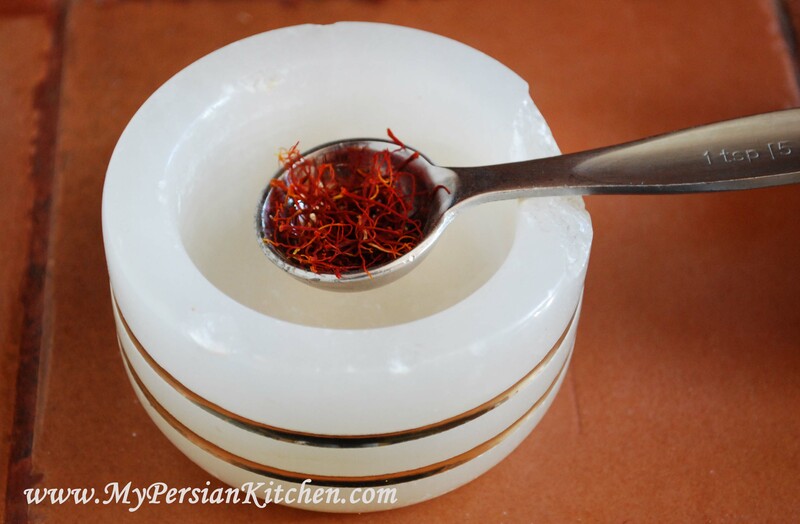 Add 3 tablespoons of hot water to the ground saffron and shake well. Allow to brew while the rice cooks. 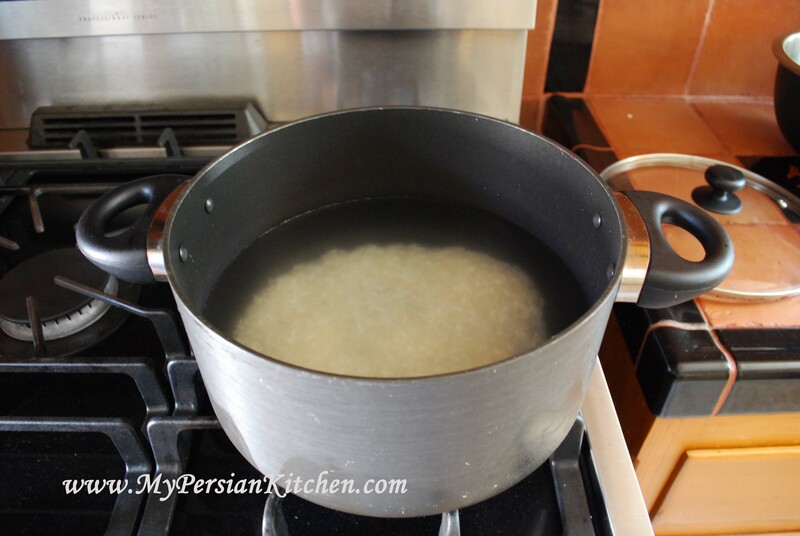 Add sugar to the rice and cook for another half hour until the water and rice become dense. 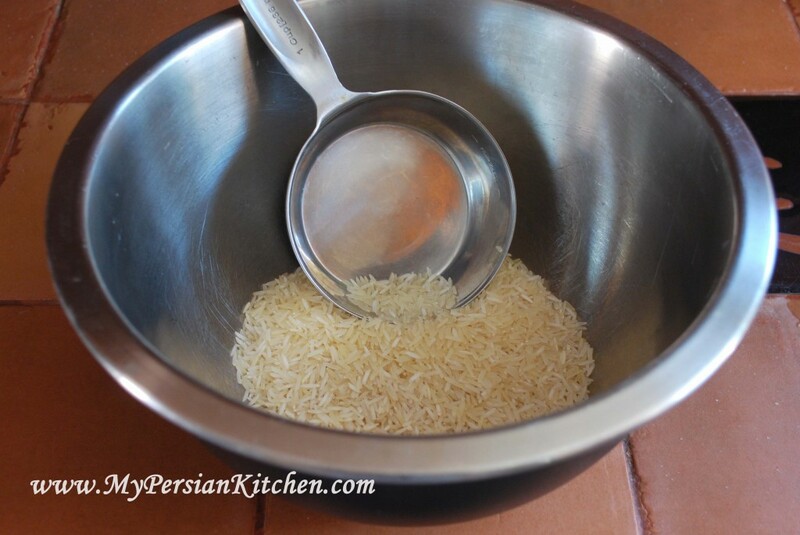 In the mean time be sure to stir the rice every so often so that it does not stick to the bottom. Add brewed saffron and continue to cook for another half hour. Add rose water with cardamom pods and slivered almonds. Mix well. At this point you can continue cooking the pudding on the stove top on low until it is completely dense, or place it in an oven proof pot and put it in the oven. THEN turn the oven to 350º and leave the pudding in there for 15 to 20 minutes. This looks wonderful and I love all the flavours. I have made vegan rice pudding with plant milk but this is really original. One to try soon, thanks. I never wear nail polish (well, only on my toes in summer) because I so often have my hands in bread, pastry etc. It would be in all our food – yuck! Ideas for good picnique food that can easily be eaten in open spaces under the stars? I was thinking of slices of kookoo, but what else is there that is Persian and can be eaten sitting on a blanket in a park without too much difficulty? I made this tonight! it was so good, it’s amazing any made it to the fridge as my bf and I were eating it out of the pot warm! I love this one! And have been begging my mum to make it for quite some time now, but I’m still waiting… Maybe I’ll try it myself now, hm? @ Anita, yes, it’s kinda hard to lay off of it!! But to me it taste better when it was nice a cool. The flavors had time to come together during the time it spent it the fridge! @ Alexandra, I think you should make it yourself and share it with your mom!! Lovely recipe. I need to make this, pronto. Love the decorative touches you put on it. That style brings back memories of how my aunts used to decorate puddings. Bria, it’s super easy! Go for it! Thank you for this wonderful recipe. My husband absolutely adores shole-zard but I had never attempted it until yesterday. I was surprised by how simple it was and it tasted simply devine! 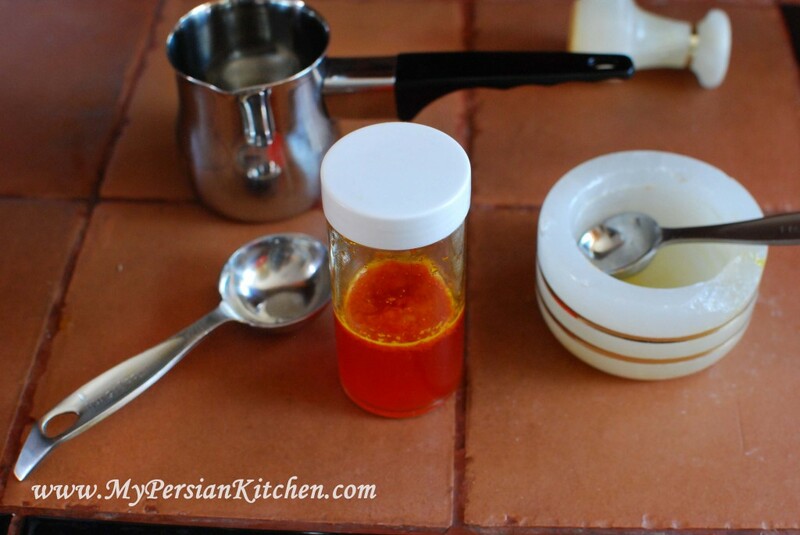 The smell of saffron and rose water actually brought a neighbor to our door! Merci for the delicious recipe. I have avoided making sholeh zard because it goes against the grain to make the rice “shol”. But, I’m making it and bringing it to a party tomorrow. How do I make this with milk and not water. I use BROWN RICE ONLY IN MY HOUSE. also how do I reduce all that SUGAR [UNHEATHY]..
for a very long time ago we’ve known a Persian lady who lived next door … in each and every Ramadan month she’d send over a plate of Shela Zard which I indulge myself into leaving nothing to the rest of family. Her recipe is nothing like yours darling which is amazing since you mentioned that it was handed over to yo by two old-fashioned women. The recipe as I could taste had a buttery flavor in it as it wasn’t grainy nor creamy … I think she’d had used rice flour instead of whole grain rice. After she’d passed away I thought I think it was time to learn how to make it myself and I tried out making it many times but failed to nail that buttery divine taste she made until I added more butter that the texture along with taste come out good and somewhat like hers. Well, I guess i’ll never know the secret as it was bueried with her but it ain;t bad having it that way. According to your recipe, I have tried it out in tasting it made by many of friends as it is (recipe) quite popular but nothing like the real traditional one …. healthier I may say but not quite like it. Still On the search of it. thank you. You should not be eating Sholeh zard! 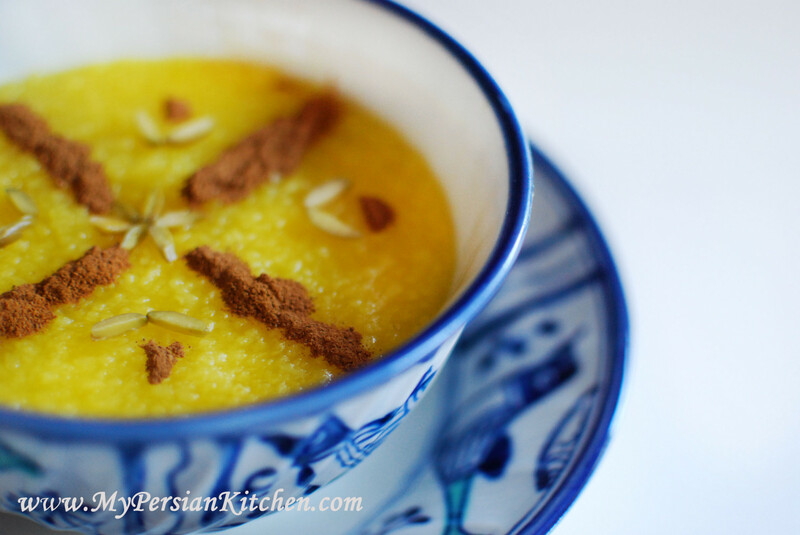 the recipe of sholeh zard is very undrestable and i made it .the taste was fantastic.as i dont like thick sholeh zard i added one cup boiling water before i put it in oven.it became very very delicious and wonderfull dessert.ty for sharing your recipe. I just made this and it is a PERFECT recipe for stolen zard. The baking tip makes a big difference. Thank you for the recipe! So excited to try all your other stuff! Thank you for this recipe! I have an Iranian friend who brought this to work for me to try- I love food, and rice pudding is one of my favourites! Also, I’m lactose-intolerant, much to my dismay. Anyhoo, one taste of this fragrant rice pudding and I was hooked! And now I can make it Thanks again! Thanks for recipie. Im iranian too but i never cooked food myself my mom is realy good about it. Now im married and trying to cook different iraninan food for my american man he realy loves each food i cook. Today im going to cook sholeh zard. can you make sholeh zard the night before and leave it in the fridge? Farida, yes, of course you can! My first Persian dish ever and turned out great! Thanks for sharing the recipe. I’m hoping my Persian friends like it. I would like to ask if I cannot find rosewater, is there something else I can use instead of it? Lydia, rosewater is pretty difficult to substitute with something else as it has a very unique flavor and scent. Hi this recipe looks great!! I want to make this for my mom for Mother’s Day, but I’m not sure I will have time to make it the day of or day before. Can I make this a few days in advance?? Again it looks amazing and I’m so excited to make it! Hi there. Your recipe calls for “rice”. Can you elaborate as to which kind of rice works best? I was thinking basmati, but then I wondered if jasmine rice would work better. Please advise.